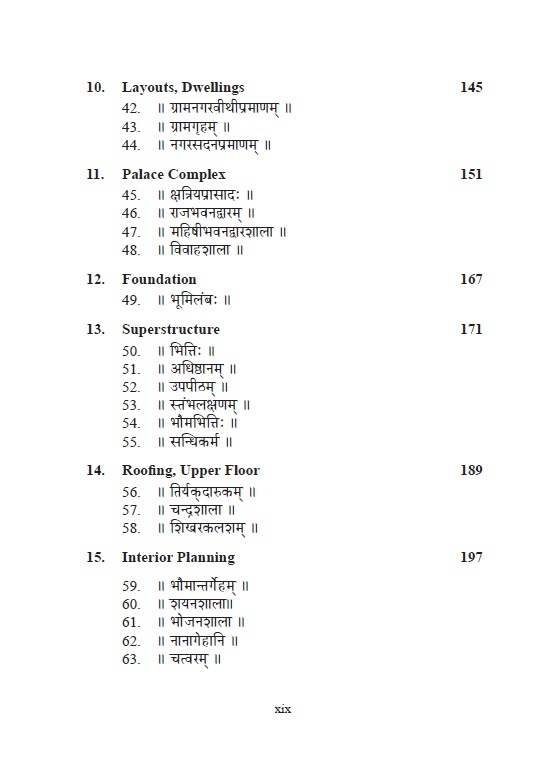 Professors Iyengar, Kannan and Wakankar have in this context brought out a critical edition of Nārada Śilpaśāstra, an ancient Sanskrit text on civil engineering. Their efforts in bringing out this text are highly praiseworthy and bound to elicit much scholarly interest in India and abroad. India has a rich history of building temples, monuments, well-planned cities, palaces, buildings, dams, water tanks, reservoirs, bridges, you name it. While our current curriculum of civil engineering relies only the modern theories and practices largely imported from the West, if we dig deep enough we could find a large treasure of advanced civil engineering practices and architectural designs backed by deep knowledge and theories even in our hoary past. Prof. R.N. 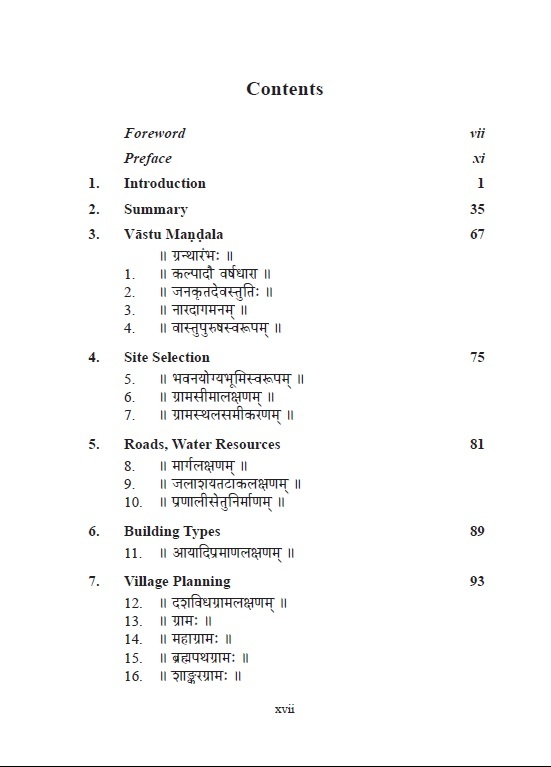 Iyengar himself a renowned Civil Engineer, helped by two reputed Sanskrit scholars, has for the first time brought out this unique Sanskrit text on the theory and practice of Architectural Civil Engineering in ancient India with Introduction, translation, notes and figures. A widespread misconception about Sanskritic literature is that it is mostly concerned with philosophy, poetry, spirituality, religion, and the arts. No doubt, it did produce countless texts in those fields, some of enormous length, but to limit it to them would be doing it an injustice. Sanskrit was an instrument of expression in almost every conceivable field: grammar, poetics, architecture, agriculture, botany, zoology, medicine, chemistry, metallurgy, polity, ethics, and countless miscellaneous topics from the science of omens to the treatment of diseased crops or horse training – the list is almost endless. Since the nineteenth century, texts of classical Indian mathematics and astronomy have at least received some attention, their contributions increasingly recognized in recent decades. Indeed, Professor R.N. Iyengar has distinguished himself with several path-breaking research papers on pre-Siddhantic astronomy, eclipses, comets and meteors, and with the landmark publication in 2013 of a reconstruction of an ancient text on astronomy and natural sciences, Parāśaratantra, which so far was available only through scattered extracts. Paradoxically, other scientific or technical fields remain largely unexplored, civil engineering perhaps most of all, despite its great importance. Why is that a paradox? Because India’s tangible heritage offers a loud testimony to the excellence of civil engineering skills, from the meticulous planning and execution of Harappan cities, wells, reservoirs, sanitation systems to the breath taking rock-cut structure of the Kailāsanātha temple at Ellora, the stepwells of Gujarat and Rajasthan, irrigation devices or Delhi’s rust-resistant pillar. Yet texts related to town-planning, water management, construction (of buildings, roads, wells or reservoirs), transport, and so on, are relatively few. Of course, a few manuals of śilpaśāstra such as Mānasāra or Mayamata have been known and discussed, but they and a few more cannot cover even a fraction of the field. 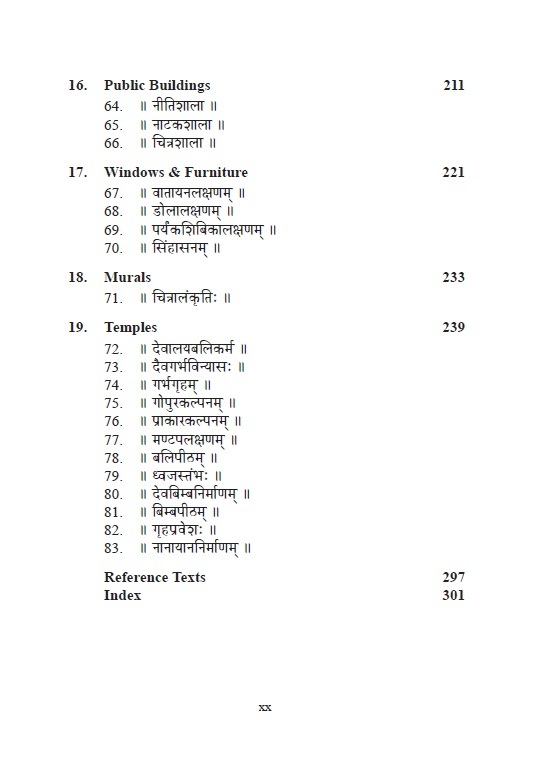 Unpublished texts doubtless exist among the millions of manuscripts languishing in collections across India and abroad – this very book is proof of it – but they have not proved very attractive to Sanskrit scholars so far (and here I should include other Indian languages, since several of them also boast a rich store of manuscripts of technical texts, some of which are in current use by the Vishvakarma community, Sthapatis and other professionals). The reasons for this neglect are complex: they include no doubt the technical difficulties of the texts, requiring some expert knowledge on the part of the editor and translator, as Prof. Iyengar has highlighted in his Introduction, but perhaps also a lingering colonial prejudice that Indian civilization’s significant contributions are in the spiritual field – resulting in a “top-heavy” bias, to borrow Sri Aurobindo’s colourful adjective, a perspective in which the material developments of this civilization have come to be regarded as somehow “low” or unimportant. It is only in recent decades that some pride in these material achievements has returned, but it must be said much of it has been poorly or ill-informed. The efforts by Professors Iyengar, Kannan and Wakankar in bringing out Nārada Śilpaśāstra are therefore highly praiseworthy and bound to elicit much scholarly interest in India and abroad. This critical edition, based on three manuscripts, comes with a careful editorial apparatus, which includes Prof. Iyengar’s extensive Introduction and numerous annotations that guide the reader through the complexities of the text and the fields it deals with. Prof. Iyengar’s meticulous discussion of the date and provenance of the text, which he attributes to the sixth century CE at the latest and to south India respectively, is in my view conclusive; it also shows the breadth of his scholarship in the technical literature in Sanskrit. Combined with his expertise as a distinguished civil engineer, he was perhaps in an ideal position to bring this onerous task to a successful conclusion. I need not enter into a description of the contents of Nārada Śilpaśāstra, which the Introduction aptly summarizes. I only wish to note how systematically it has been conceived and organized, with long discussions on the lay of the land, the qualities of different soils, the planning of boundaries and roads (which should have “the back of a tortoise” to let rainwater drain away, which some of our modern road-makers do not seem to have realized yet), the construction of bridges, causeways, reservoirs, check dams, dwellings of various kinds (royal and private, but also public ones such as courts, temples and theatres for various performing arts), concepts of town-planning applied to different kinds of cities, including fortified ones, and the different components of a house, with much thought given again to the flow of water, but also to ventilation, the various pieces of furniture and the religious elements of a temple or a private dwelling, including icons. The text, in other words, implies a sound knowledge of geology, water management, architecture, masonry and carpentry, art and sculpture, to use the English terms – all of which are implied in the single concept of śilpaśāstra. Before a 21st century civil engineer dismisses the above as curiosities for the scholar or historian, he or she will do well to give the text a fair reading and, wherever possible, experimenting. After all, quite a few temples of over a thousand years of age are still standing in India; how long our skyscrapers will last is anybody’s guess. The efficacy of some of the concepts and devices of traditional water management and architecture, to mention only these two fields, has long been acknowledged; an objective study of other achievements of ancient civil engineering could yield some surprises. It is nobody’s case that we should turn the clock back, but it is certain that from the angle of sustainability at least, if not also aesthetics, our “modern” concepts or urbanism and architecture would benefit from an open-minded scrutiny of texts of śilpaśāstra such as the one Prof. Iyengar and his collaborators have now put in our hands. If India had Sharia law, Tharoor would have become Tahir!